The “Have a Nike Day” collection looks to have a pretty extensive lineup as new additions keep rolling in. 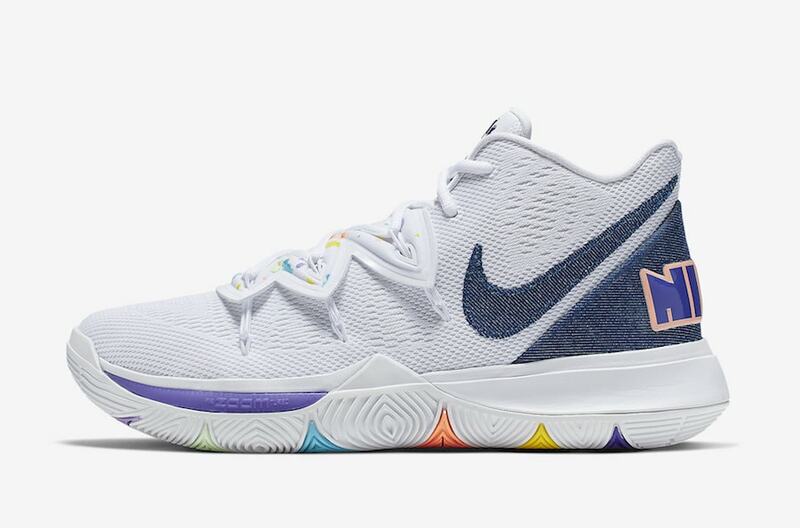 The Nike Kyrie 5 looks to join the fun as it takes on a perfect spring edition that boasts pastel hues and denim branding. Nike has hit the jackpot with their “Have a Nike Day” collection this year. For Air Max month, we saw a couple of Air Max’s get decked out for the occasion and they all were perceived well. Nostalgic vibes that are added to different models have allowed the campaign to grow as vintage themed items are a hot commodity in today’s fashion world. 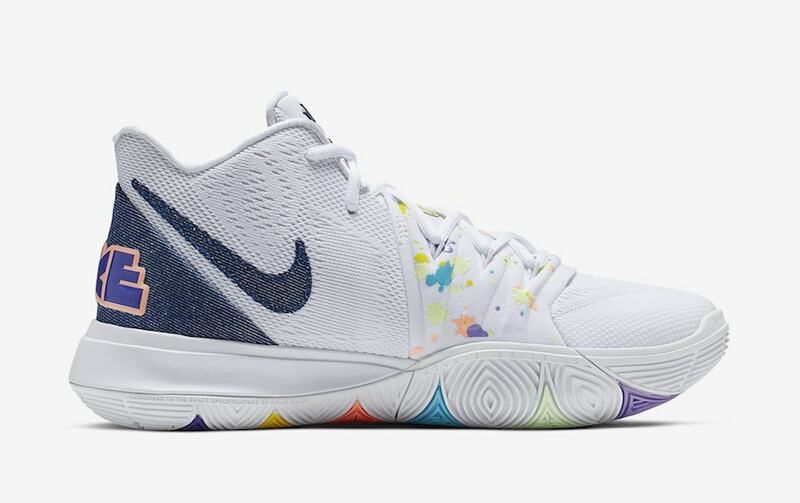 Those aesthetics look to take over the Kyrie 5 next as the basketball shoe is added into the “Have a Nike Day” lineup. Kyrie Irving has definitely earned a lot of respect from sneakerheads as he has combined athletic sustainability with fashionable iterations. 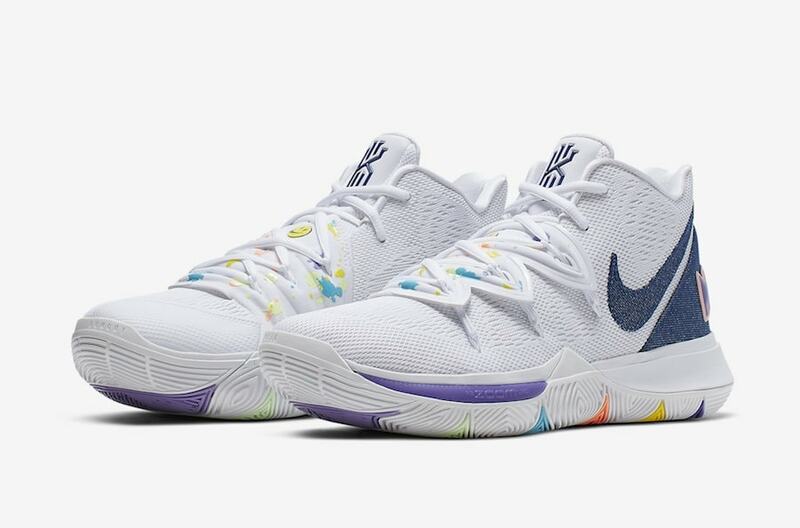 Seeing that the sneaker has seen a lot of different artistic themed colorways as of late, it’s a no brainer that it would be featured in the “Have a Nike Day” campaign. As its predecessors took on more vibrant colorways that included coral, purple and turquoise, the NBA star toned his version down. The upper features an all-white primeknit that is accompanied with a vintage themed denim Nike swoosh and heel overlay. 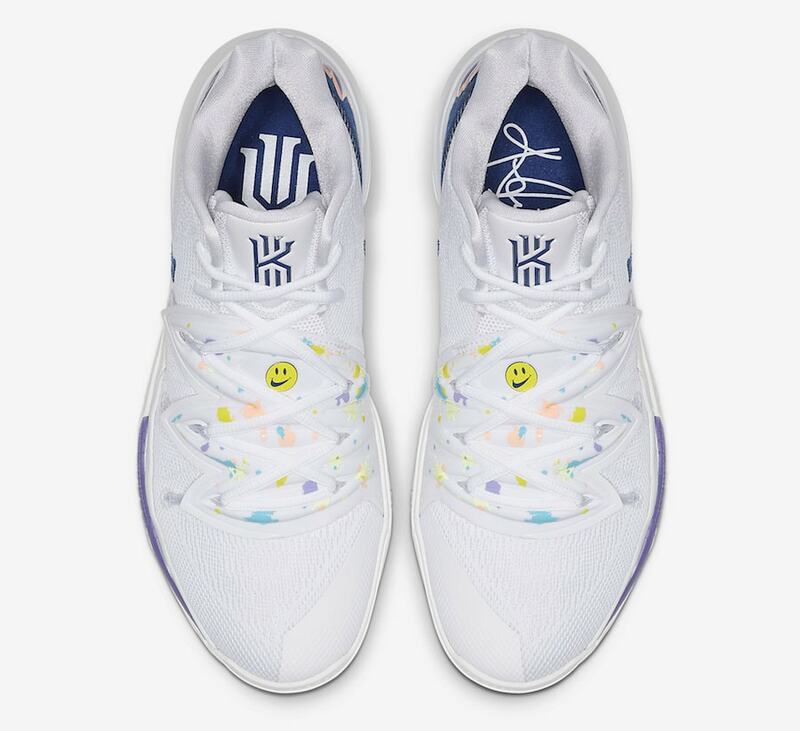 The distinctive Venus flytrap themed lace cover is in white as well but is highlighted with colorful pastel paint splatters and Nike’s yellow smiley face logo. 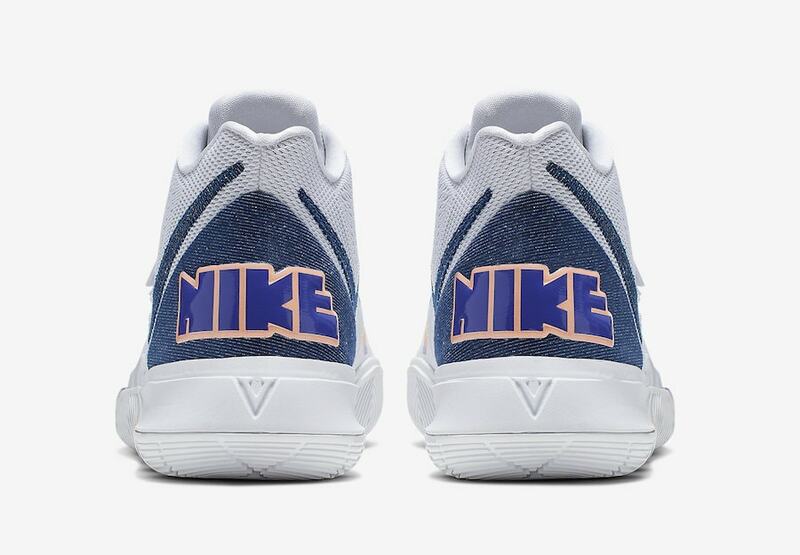 Another retro addition to the sneaker is featured on the heel as it contains a bold retro purple Nike logo. 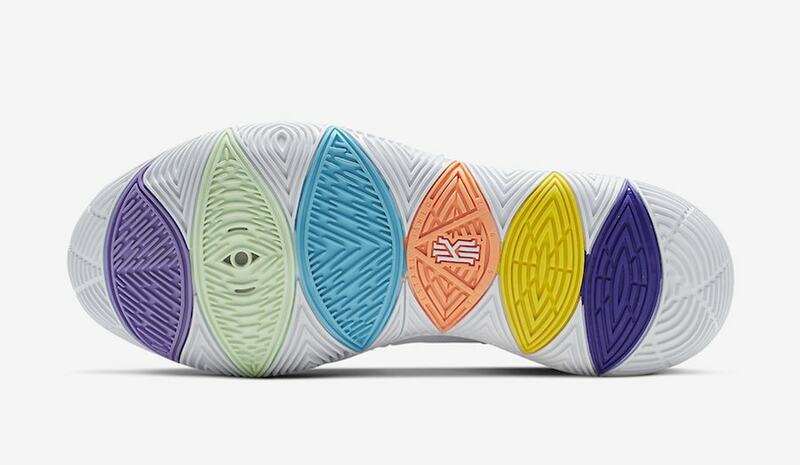 Moving to the bottom portion, the midsole presents a combination of white and purple, while the outsole embraces subtle pops of color from the eye-shaped pieces on the bottom of the shoe. As of now, there is no word on an official release date but if you’re wanting to pick up a pair, they should become available sometime this spring season. Expect them to drop at select retailers and Nike.com for a price tag of $130. Check out more images below, and stay tuned to JustFreshKicks for updates and other Nike news.